"I tend to not grab my camera on the way out the door as often when it's raining as I do when it's beautiful," writes Joe Rodricks. 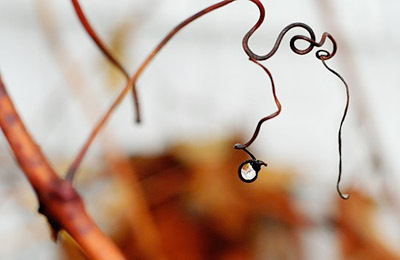 "However yesterday I noticed this drop of water, caught for its eternity, in the grasp of a dormant grape vine. I dashed back into my house and grabbed my D300." "On it was my default, cheap-but-amazing, Nikon 55-200. I fired off a few shots at f8 to make sure the image was sharp. I wasn't very happy as the minimum focus distance is somewhere around 6 feet. I ran back inside and put on my trusty 50mm f1.8 and set it to f4 to keep it sharp. The difference with the depth of field at f4 with the 50mm over f8 at 55mm was preferable to me, as the wall in the background is only a few feet away." "There was just something tranquil about the whole thing that made me feel good for having captured it."